Veyilaan talks about a person who worked in a Cheroot manufacturing plant in South Tamil Nadu, India. சுந்தரம்! ஏன்யா இன்னும் ஒக்காந்திட்டே இருக்குற? சுருட்டுக் கடை மொதலாளி மட்டுந்தான் ‘சுந்தரம்’னு பேரச் சொல்லிக் கூப்புடுவார். மத்தவங்களுக்கெல்லாம் அவர் ‘செட்டியார்’ தான்! Sundaram! Why are you still here? You should be home already. Yes boss. On my way. Only the ‘Cheroot Store’ owner would call him ‘Sundaram’. For the others, he is ‘Chettiar’. Chettiar with bulging belly dressed in tobacco stained torn under-shirt and dirty lungi could always be seen near the ‘cheroot store’ doorsteps. He would be there until the store closes. Sometimes even afterwards. The ‘cheroot store’ is not really a ‘store’ per se. It was a company manufacturing cheroots. ‘Danushkodi Vilas Suruttuk Kampani'(Tamil) – Danushkodi Vilas Cheroot Company. The company could have been called ‘Cheroot store’ because some smokers buy their cheroots here. If anyone smokes a cheroot, people could smell it four doors down the lane. If a single cheroot could be smelled that far, imagine a ‘Cheroot store’. 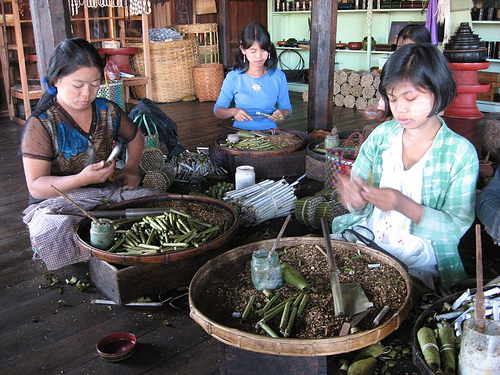 ‘The Cheroot Store’ used to be the landmark for people. Even people asking directions would base their questions on ‘The Cheroot Store’. At one time 40-50 people used to work at ‘The Cheroot Store’. Now barely ten people work there. Sundaram Chettiar used to work there too. 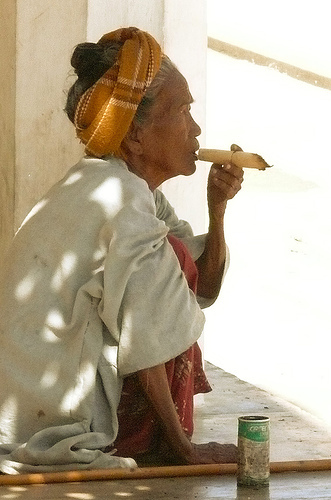 He might have worked at ‘The Cheroot Store’, but had never ever smoked a cheroot. Chettiar would do all the work at the ‘Cheroot Store’. He would seperate the tobacco leaves packed in a bundle. Wash the tobacco leaves in a tub. Dry them under the sun. Cut the dried tobacco into small squares. Roll the tobacco squares. Stick labels. Pack them a dozen to a pack and wrap them. Chettiar would do all the work at ‘The Cheroot Store’. Chettiar's job was quite sedentary most of the time and he started developing a tummy because of that. And as he got older, Chettiar's work got affected because of the big belly. The Cheroot Store owner called him up one day and said that he was not quite active and told him to stay at home. But, Chettiar could be still be seen sitting on the steps of ‘The Cheroot Store'! One day I asked Chettiar, “Why are you sitting here always, Chettiar”? He replied, “I've been working here for years and am not able to break my habit’. I kept on asking Chettiar whenever I saw him. Chettiar hesitantly opened up, after my persistent questioning. Chettiar said, “I'm so used to this damn Tobacco. I'm not able to stay at home without breathing in its aroma. I did try as much as I could to stay at home. But, am not able to do anything. I don't know how to talk about it. That's why I'm sitting here every day breathing in the aroma”. “What do you do at night”? “Even at night, before going to bed, I would open up a cheroot by my bedside. Only then, I'm able to get a good night's sleep”. “Did you do this when you worked at ‘The Cheroot Store”? “No no. Then, even after coming home my body would smell of tobacco. Even my clothes”. Only then, I knew why Chettiar had been there at the Cheroot Store's doorsteps all day long. I visited my town a few days ago. And came to know that Chettiar had succumbed to the disease that comes to smokers.